When Virginia decided to secede from the Union in 1861 the western part of Virginia seceded, in turn, from Virginia in 1863. 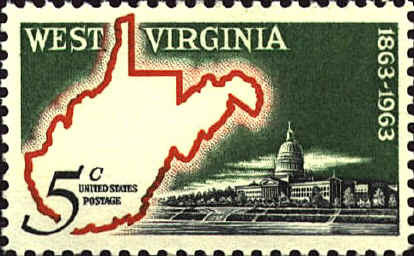 West Virginia was created as a State created because of the Civil War. 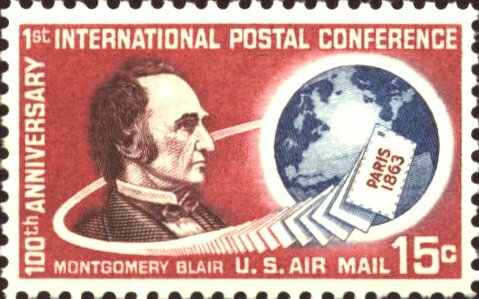 Montgomery Blair (1813-1883), was Postmaster General from 1861 to 1864. He the first International Postal Conference at Paris in 1863, the forerunner of the Universal Postal Union. Blair also inaugurated George B. Armstrong's recommendation for a Railway Mail Service in 1862, and a Postal Money Order System in 1864. 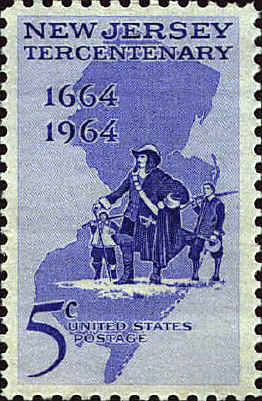 In 1498 John Cabot sailed off the coast of New England and claimed what is now New Jersey for England. In 1664 Lord John Berkeley and Sir George Carteret, two of the Proprietors of the Province of Carolina, received the lands between the Delaware and Hudson Rivers from the Duke of York, to whom they had been granted by King Charles II.